As the Volvo Ocean Race fleet continued to charge west at breakneck speeds on Tuesday, a crucial decision that could ultimately affect the overall outcome of Leg 2 was looming. 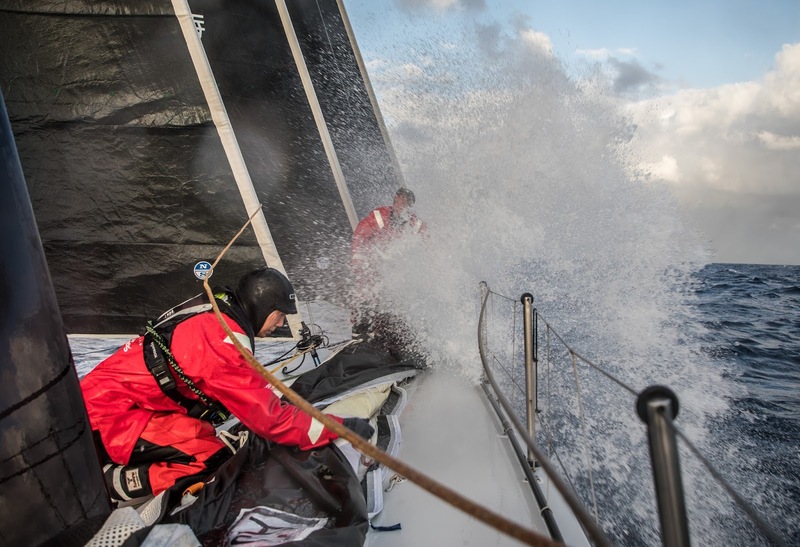 The seven teams have been treated to a wet and wild opening 48 hours to the 7,000 nautical mile stage from Lisbon to Cape Town, their biggest challenge to date. Boat speeds have been soaring close to 30 knots as the VO65s charge downwind on a tradewind-powered sleigh ride that has lasted since leaving Lisbon on Sunday. But as well as having to deal with the physical demands of such extreme sailing, the Volvo Ocean Race crews are caught in a mental game of chess on water as they try to choose the ideal moment to head more directly south. At 1300 UTC MAPFRE were showing as the lead boat with Dongfeng Race Team and team Akzonobel in second and third. But the reality at this stage of the leg is that official rankings come second to actual positions on the water relative to the weather that lies ahead. The big decision revolves around whether it will pay to be further west or further south. The fleet were today split by just 60 square miles, with MAPFRE opting for the more southerly route, while Dongfeng around 40 miles to their north west choosing the westerly option. Not only must the crews avoid a huge wind shadow in the lee of the Canary Islands but also consider the best possible crossing point for the Doldrums, the ever-moving band of low pressure lying three-plus days away to the south. According to Dongfeng navigator Pascal Bidegorry, the third night at sea will be crucial to the rest of the leg. With a forecast for the breeze to ease over the next few days, the focus for each of the teams is to make as many gains as possible before they have to throw their cards on the table. “The entire fleet has come to find this acceleration off Madeira and now we have to play with the wind shifts,” said MAPFRE’s Antonio ‘Neti’ Cuervas-Mons.